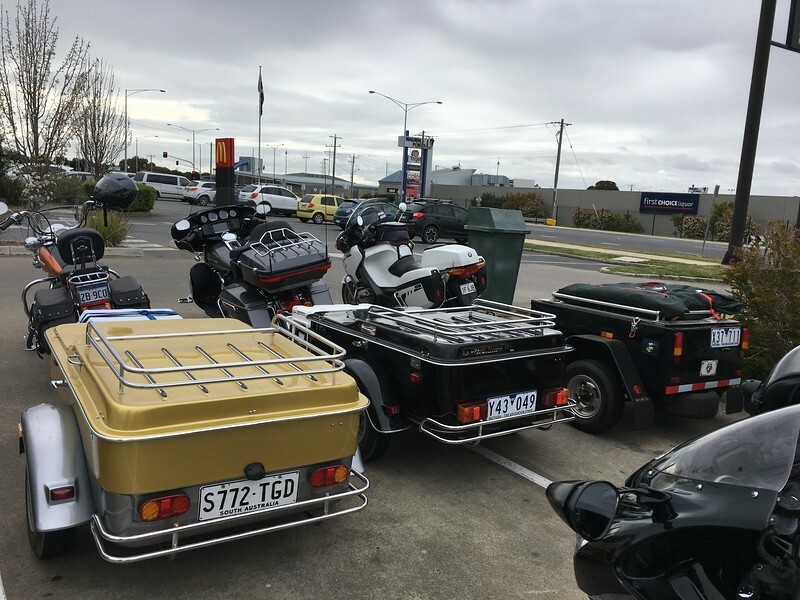 Seven riders set off from Waurn Ponds under cloudy, threatening skies on Friday 28 Sept. Ron H (Gentle), Mac, Nigel and I had our bikes loaded with camping gear and Richard S, Mal S and Phil R had their bike trailers – that were soon nicknamed the ‘B Doubles’ by Nigel. Mind you, before the weekend was out we were all very thankful for the catering gear and esky’s that those trailers contained. 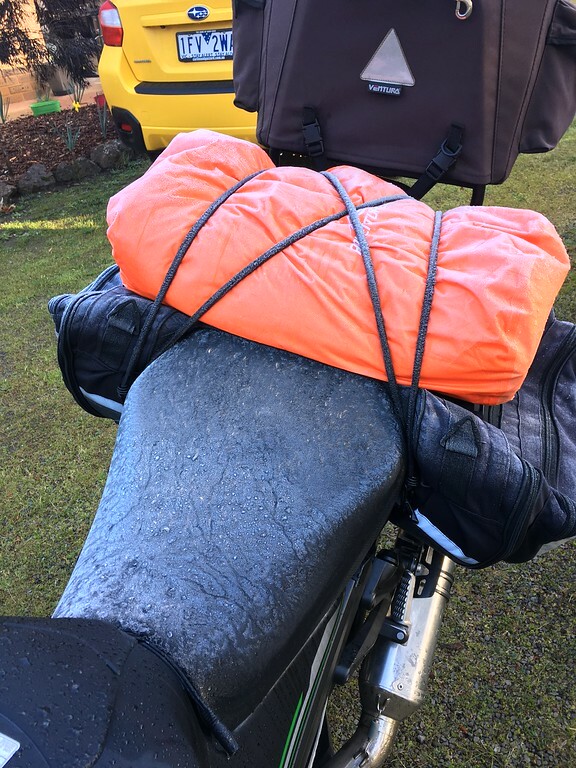 This was my first moto camping trip since my late teens, and this was very much a ‘make or break’ trip in terms of future motorcycle camping for me! 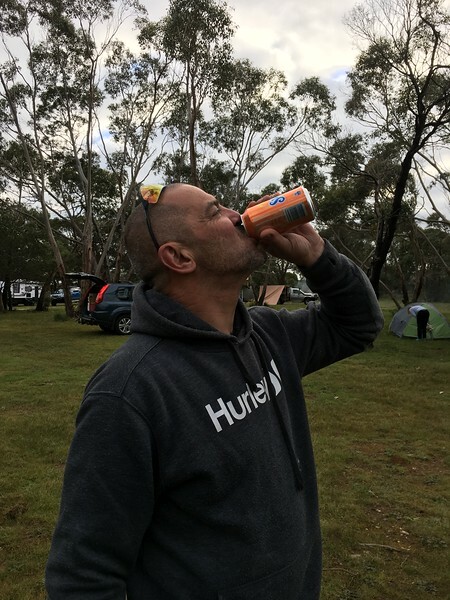 Our ultimate destination was Mc Namara Park race circuit at Mount Gambier, but with the first night at Gary & Paula Foley’s camp at Wannon, just outside of Hamilton. We decided to take a more northern route to try to dodge the cold front that was moving across the state. Gentle led and we headed up to Skipton and then along the Glenelg Hwy to Lake Bolac for lunch. It was pretty cold with the temp hovering around 11C, but then dropping down to 6C as a brief hail storm blew through. From Lake Bolac we had a pretty good run along the Glenelg Hwy to to Dunkeld and then on to the supermarket in Hamilton for fuel, drinks and food to BBQ at Wannon. Rob had travelled independently of the ride group and arrived at about the same time as us. We actually arrived at Wannon in bright sunshine. We allocated ourselves rooms, unloaded our gear, broke open some refreshments and the fun began! 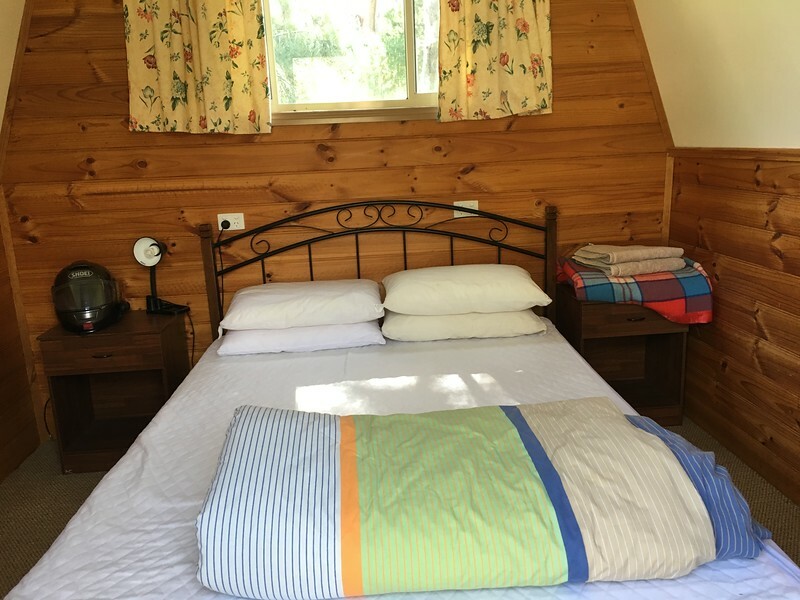 The fully enclosed recreation room at Fole’s place is a fabulous facility with a kitchen, lots of lounge chairs and tables, three fridges, a great sound system, an open fire and an indoor BBQ. As it cooled of we lit the fire and cooked a meal on the indoor BBQ. The evening flew by to the soundtrack of lots of banter, reminiscences and Joe Bonamassa music pumping. I checked the temperature as I was going to bed. 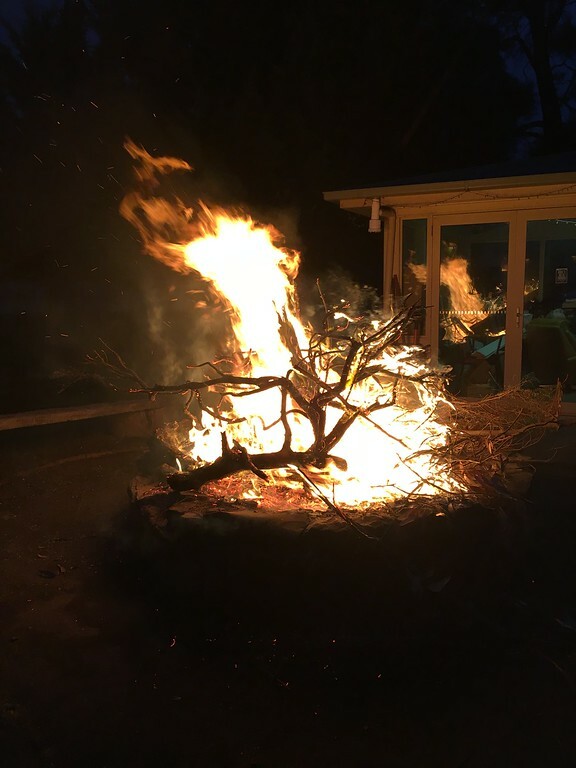 It was 4C in Hamilton at 9.50pm – it was going to be a cold night! Glad that we weren’t in the tents. We awoke to a clear, frosty morning. It was going to be a great day for our run over to Mt Gambier and Mac Park. The bikes were coated in frost and Nigel’s Suzuki wouldn’t start. …. but, we were treated to the sight of Gentle actually running as he pushed Nigel’s machine (which started). I think seeing Gentle running was a first in the time I’ve known him. 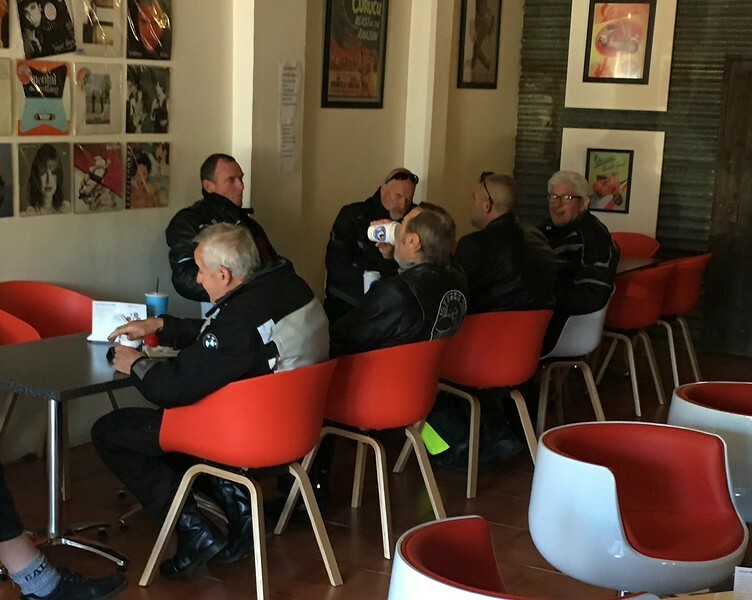 Mal S couldn’t believe his eyes and just shook his head – or was that at my rookie error of another initially non starting bike – due to being in gear with the side stand down! I told Mal quietly that we will never speak of that again. Foles was packed up and ready to lead us off to Casterton for brekky. 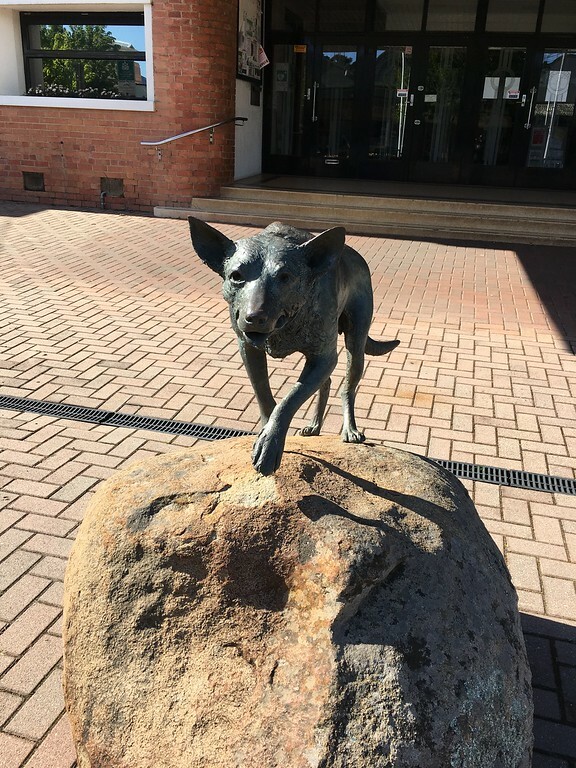 Casterton is said to be the birthpalace of the Kelpie and the annual dog trials is a big event here. Then on to SA and the supermarket and Dan Murphys in Mt Gambier for more supplies. 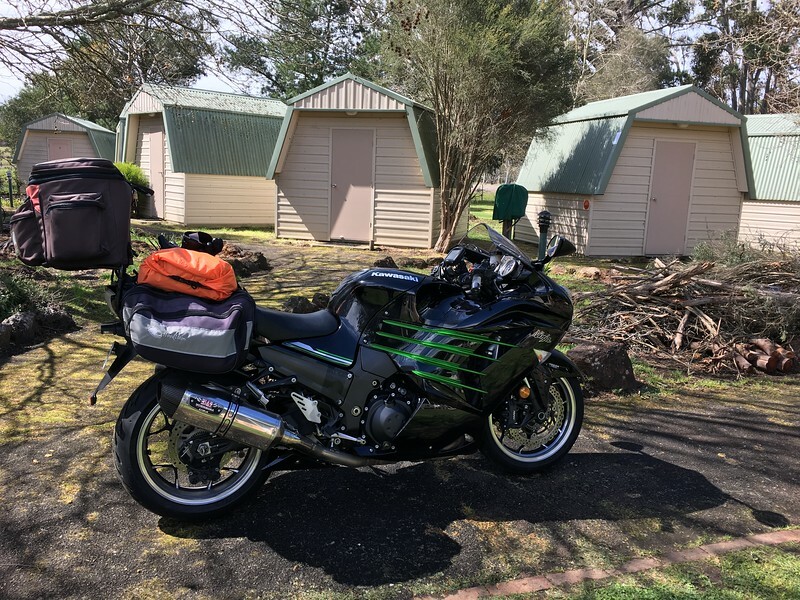 The mighty ZX14R clocked over 89,000kms just as I crossed the border into South Australia. The Mac Park track proved to be a really nice spot to camp. 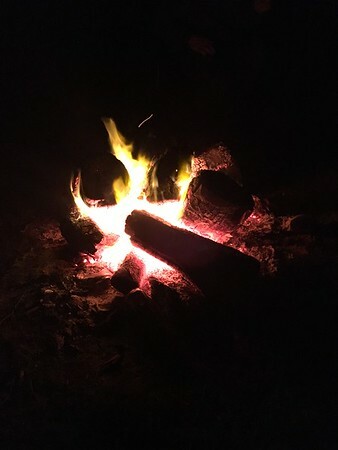 And cheap, $10 for entry to the track and another $10 camping fee – with free firewood delivered to our site. Perfect really – except for those bloody noisy motorbikes! Arthur Sissus dominated the superbikes and set a new lap record. Then sun got low and the breeze became cool and we all reached for extra layers and lit the campfire. Phil and Mal did a terrific job cooking the evening meal for all of us and then repeating it for a bacon & egg brekky for everyone. Thanks fellas! You two made the catering look easy. Breakfast time also saw Gentle in strife for not wearing a helmet while moving his bike! We packed up first thing Sunday morning with dew on the tents and then went for more coffees and to check out the first few races. 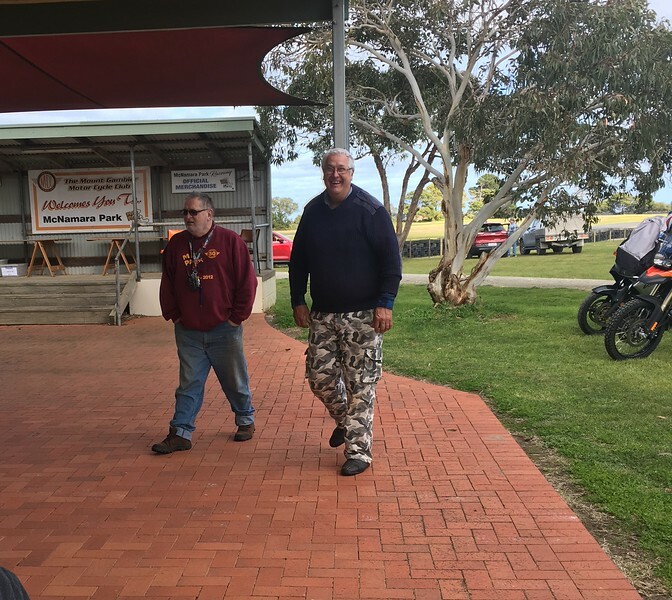 Gentle and Foles stayed on as Ron was staying in Wannon again Sunday night. The rest of us decided to hit the road around 10.00am ish as it was roughly a five hour ride home. We topped up our fuel tanks in Mt Gambier and I led off along the Jubilee Hwy which became the Prince’s Hwy goatrack in Victoria with a ridiculous number of lengthy stretches of 60kph and 80 kph speed restrictions due to the crappy condition of the road surface. We didn’t see any highway patrol cars on the run home which was a surprise as it was the AFL long weekend blitz was on. Then I was breath tested at a booze bus on the Anglesea Rd about 10 kms from home. Thanks to everyone who contributed to a great weekend. I’m certainly up for more moto caming in the future! Many thanks to Gentle for organising the ride and huge thanks to Phil and Mal who went out of their way to purchase lots of food, carry it in their esky’s and, seemingly effortlessly, cook for us all to make sure that we were all fed properly and not buying trackside garbage. This was all done with good cheer and a ‘no worries’ attitude. You fellas really were terrific … thanks again! As I rolled in the driveway I’d clocked 777 kms for the weekend. 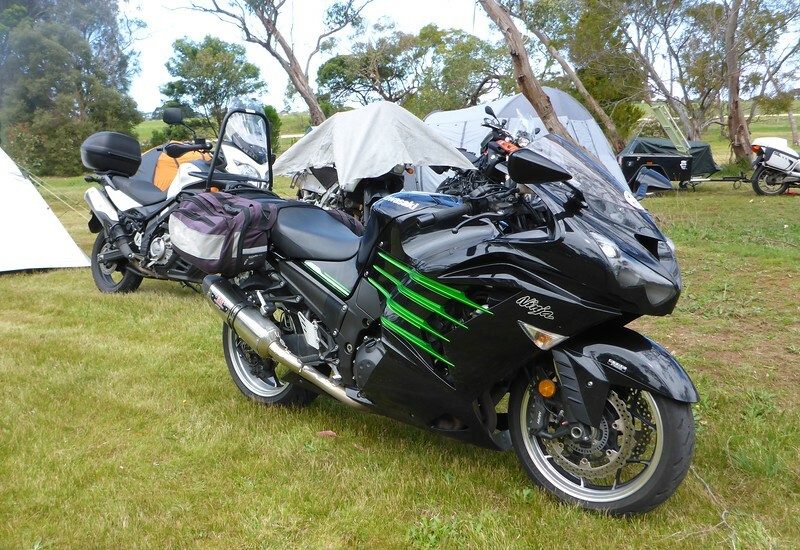 This entry was posted in Kawasaki ZX14, Ulysses Geelong Branch and tagged McNamara Park raceway by jcpearce. Bookmark the permalink. 89 000km already!? I didn’t think you had had the big Kwaka for that long. Iseem to remember a blog post about you buying not too long ago….. The Kwaka just turned 5 actually (how time flies) and I had hoped for 100K kms but life gets in the way. We built a new house last year and I spent a lot of time landscaping, laying drainage pipes etc. The motor still feels really strong and other than replacing the cam chain tensioner there have been no mechanical issues at all. It’s still a great bike to ride and still amazes me with its user friendly performance. Camping certainly is a lot more interesting when you get a bit older and grumpier hahaha. I looked at those bikes with trailers and thought WTF, but then when I saw the delicious BBQ’s you guys were having and then just nodded in appreciation. Not that I’ll be getting a trailer anytime soon. I bet you saved a packet and ate better on your trip. Steve, I couldn’t see a trailer behind my bike either! 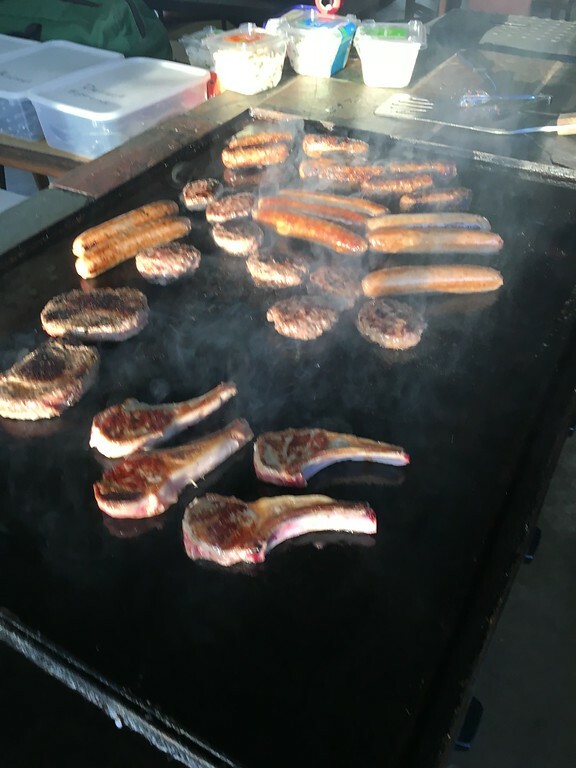 However, it was great to benefit from them with cold beer in the esky, along with food and all the cooking utensils. These fellas attend a lot of rallies and like to have tents that they can stand up in and stretchers to sleep on. Yes, we ate like kings and not having take aways is much lighetr on the wallet – let alone healthier. It’s only a few weeks until the MotoGP at PI and we are spending 4 nights there, but camping in Cowes with our car and camper trailer. Dorothy & I have three day passes and I’m really looking forward to having more time there and somewhere to retreat to if the weather turns bad. Great, we will be heading down to the Island this year as well. We are staying in the trackside camp ground, that should be interesting. I’ll give you a call and we should catch up for a beer and chat. Great stuff Steve. I look forward to catching up for a beer! Wow, found your blog again! Did you traded your 2010 ZX14 for a ZX14R? I bookmarked yours to keep track of your travels! Ride safe! Stunning photography Kofla! I’ve added your site to my links.